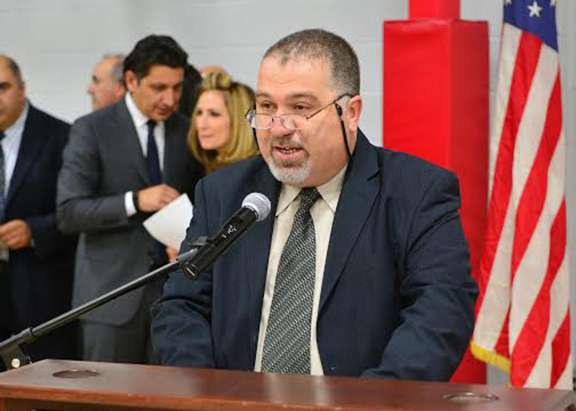 On Wednesday July 1, Homenetmen Massis Chapter held the much anticipated Grand Opening and Ribbon Cutting event of its new Jirair & Serpoug Sakissian Gymnasium. Close to two hundred community members joined the Sarkissian family in the inspiring invocation and blessing of the gymnasium rendered by his Western Prelate Moushegh Mardirossian with the accompaniment of Rev. Father Razmig Khatchadourian. 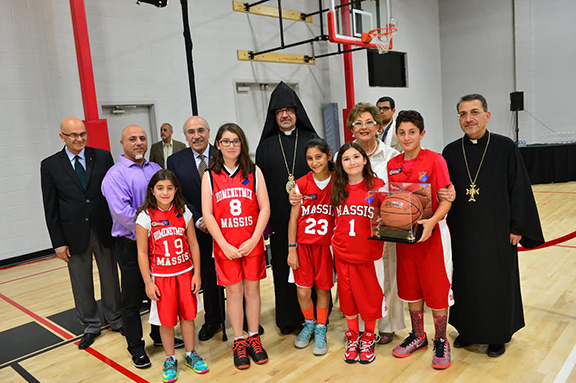 The Gymnasium’s benefactors, lifelong Homenetmen members Jirair and Serpoug Sarkissian, cut the ribbon surrounded by their children, grandchildren and family members. The event’s mistress of ceremonies, 2012 and 2013 Homenetmen Massis chapter executive chairlady Katia Karageuzian, welcomed the guests who included Homenetmen Central Committee representative Viken Tavitian, representatives of the Homenetmen Western USA Regional Executive Committee, representative of the Homenetmen Lebanon Regional Executive committee Vatche Dzadourian, , ARF Central Gomideh representative Mardig Gaboudian, representatives of ARF Rosdom and Arshavir Shiragian Gomidehs, representatives of the Holy Martyrs Apostolic church board of trustees, Sweden’s Malmo city Apostolic Church board chairman Vahe Asadourian, Exemplary Homenetmenagans Albert Ounjian and Zakar Tchorbajian, as well as representatives of Hamazkayin Baruyr Sevag chapter, ARS Anahid and Lori chapters, Ferrahian High School’s board of finance and sister Homenetmen chapters. Also in attendance were several Homenetmen Massis chapter founding members, past executive chairmen and vartchagans. The official program commenced with the flag ceremony performed by Massis scouts. The Sarkissians were then invited to unveil the official sign of the Gymnasium; a unique creation by Tamar Abkarian Tepelekian, bearing Massis Mountain in the background and inscriptions reflecting the year Massis chapter was founded and the Genocide Centennial currently in observance. The 2014 and current Homenetmen Massis chapter executive chairman Ara Tepelekian and co-chairman Zohrab Bostanian presented the Sarkissians with an engraved glass token, expressing the chapter’s gratitude for their generous benevolence and dedication to the Armenian youth. In turn, Massis scouts presented the Sarkissians with a pair of scouts jackets embroidered with the basketball court’s center logo on the back. Massis athletes followed suit presenting a basketball autographed by the current members of the Massis Executive committee. 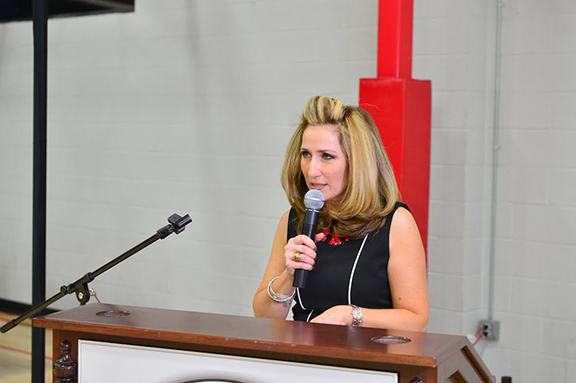 Jirair Sarkissian took a moment to express his heartfelt remarks on the occasion, reflecting upon how much this project meant to his wife Serpoug, an accomplished basketball player and coach, who had experienced firsthand the difficulties the lack of practice venues represents for young athletes. 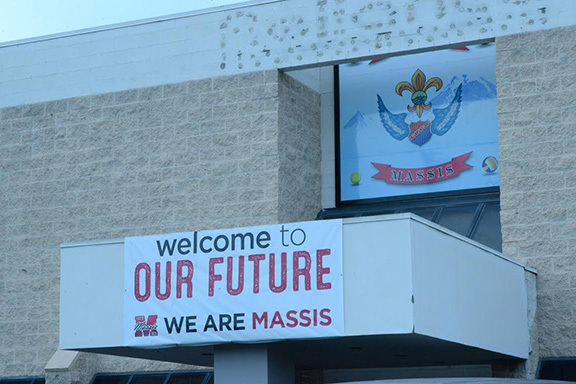 Twenty years in the making, this project is the fruit of labor of dozens of devoted, hard working Massis volunteers, as well as generously supportive members, donors and benefactors. It cements Homenetmen’s mission of Hayabahbanoum and secures the future of Massis chapter. Mistress of ceremonies, Katia Karageuzian, likened the journey to the intricacies of climbing up a mountain, with the sweet triumph of reaching the summit; and thanked Jirair and Serpoug Sarkissian for helping the chapter “raise Massis to the elevation it deserves to be at!” The official program’s closing remarks were presented by Homenetmen Western USA Regional Executive committee member, Pierre Manougian, who reflected upon the humble character of Jirair Sarkissian and the many leadership positions he has served in Homenetmen, as well as the reliance of the organization’s programs on the generous support of philanthropists. Excitement rose as Serpoug Sarkissian was asked to try her hand at shooting the gifted basketball in the gym’s first installed basket. Loud Cheers went up the air as she obliged and delivered! Guests were then treated to an elegant champagne reception accompanied by the live performance of talented singer Ashot Guiragossian. A perfect ending to a monumental milestone in the history of Homenetmen Massis chapter, which now looks forward to the exciting plans in store for the construction of the lobby and conference rooms in the forefront of its new center. All the Square Foot Sponsors and Donors of its New Gymnasium! Next is The Construction of the Offices, Lobby and Conference Room!